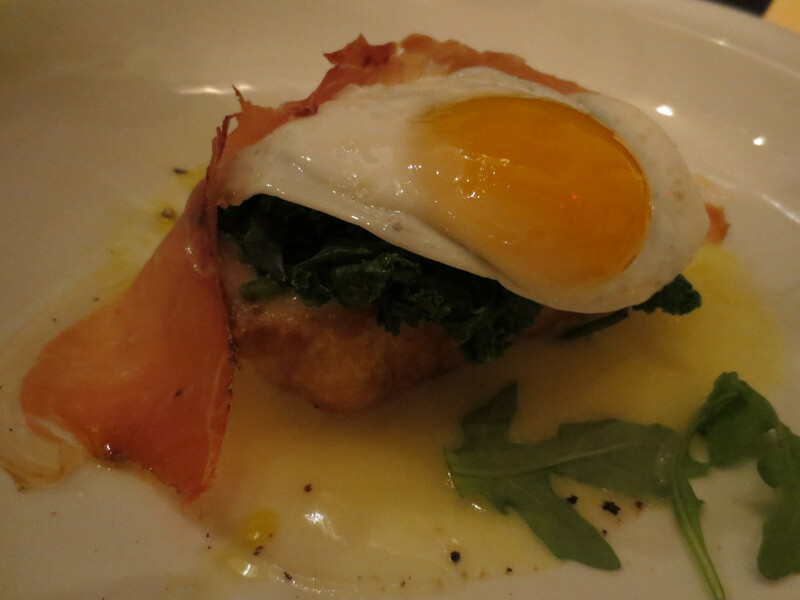 Who can resist a starter of runny egg on sauteed spinach with prosciutto on toast? I think I’ve found my favorite Italian food place in Los Angeles. I say “think” because I have been known to eat such widely declarative words before. Long ago, I said it about Piccolo, but that was pre-Cute Gardener when I had no idea how truly spoiled I was about to become upon falling in love with a man who cooks pasta at least twice weekly. I said it at Osteria Mozza after slurping up cold squid ink and uni pasta. I said it about Scarpetta after digging into a breadbasket full of buried Stromboli. 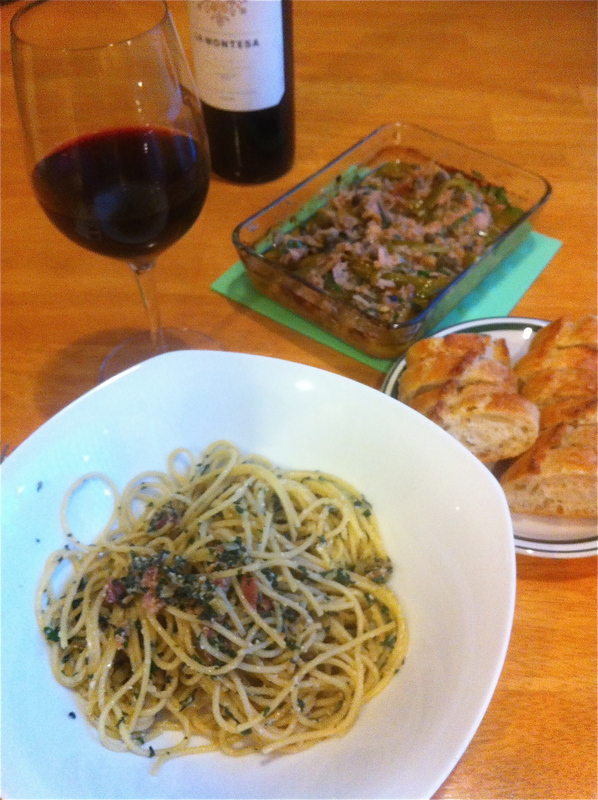 I said it about Il Fico after falling in deep love with a bowl of strozzapreti. I said it about Chi Spacca after one bite of the orgasmic veal roulade, dripping in caramelized cow parts. I said it at Bestia after sucking the daylights out of lamb neck studded with the most appropriate chimichurri of mint. But now, I have definitely hit a pasta and pork nirvana and it is called Factory Kitchen. First off, there’s the pasta. From the moment we drove down an alley-like street between two ominous rows of downtown L.A. warehouse buildings full of progressive design collectives, art entities and rooms for the occupancy of “surviving just fine off the radar” businesses and start ups and into the hands of a valet, I knew entering the glass doors of the unassuming Factory Kitchen was unique. Understated restaurant stuffed amongst the brownstones of industrial L.A. thriving and packed in its burgeoning popularity where every seat in the dining room has a neck-reaching view into a bustling kitchen. But from where we were seated I had the best view of all: right next to the pasta machine and the two cooks who stood guard all night cranking out identical paper thin sheets to be squared into ravioli or wrapped around densely packed inch long tubes of ground meat or folded like neck scarves into signature, unctuous dishes for the pleasure of us diners. I was the lucky recipient of the latest batch of perfectly rolled casonzei which looked like pieces of wrapped hard candy with twisted bows on each end, holding in luscious and rich morsels of veal, pork and sausage dressed sparingly in a cured pork, butter and sage sauce. 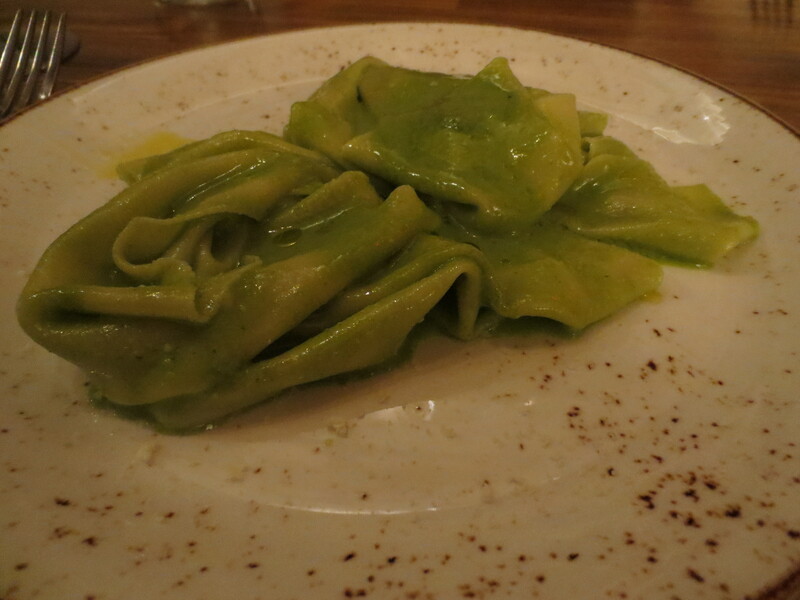 I knew the CG would order the mandilli di seta—a pasta resembling flat wide folds of a handkerchief and topped with ligurian almond basil pesto. He is a fan of the fat noodle and is hard pressed to resist a good Chinese flat noodle, spiced shrimp stuffed dim sum rice sheet or toothy pappardelle. But we had talked earlier in the day about how easy it is to mess up a dish like this, where noodles tend to come over cooked and mushy, swimming in sauces that fail to prop up the pasta. But in this case, the noodle was perfectly al dente and the green dressing complemented its undulating crevices in ways we may never comprehend remaining half vegetal and half buttery while overall, exquisitely blended. 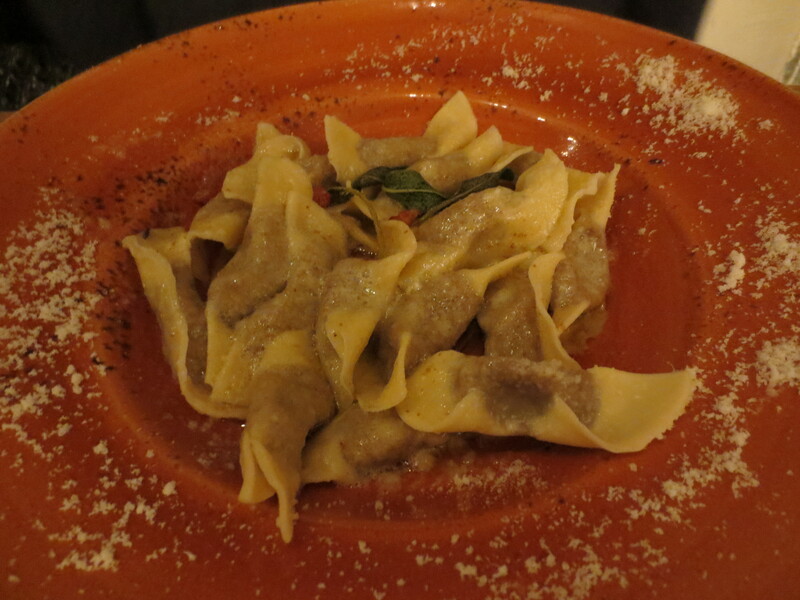 We normally stop there- a starter and two pastas representing an ideal dinner for two. But there were two more things calling our attention. 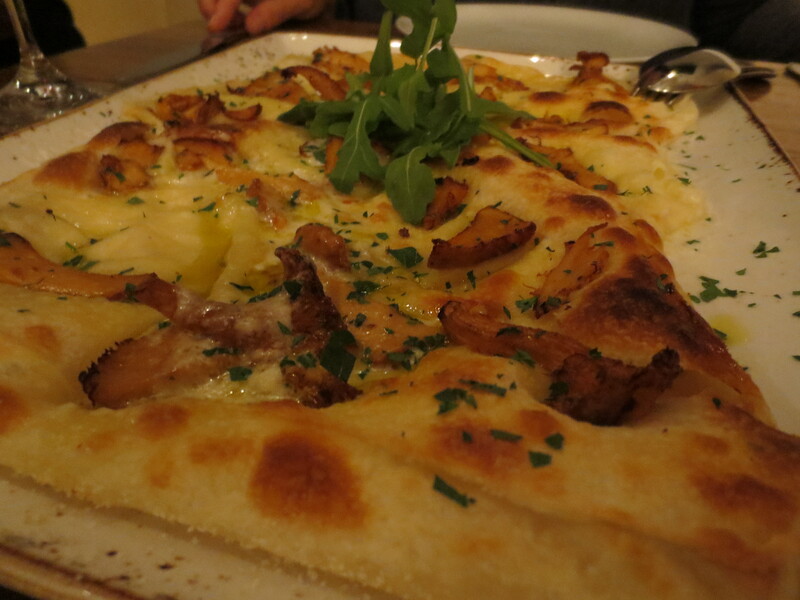 A focaccino calda di recco al formaggio or piece of silky slim flatbread without the structure and rigidity of pizza but more wavy and pillow-like, which came faintly strewn with melted Italian cow’s milk crescenza cheese and studded with shaved foraged mushrooms, olive oil and parsley. 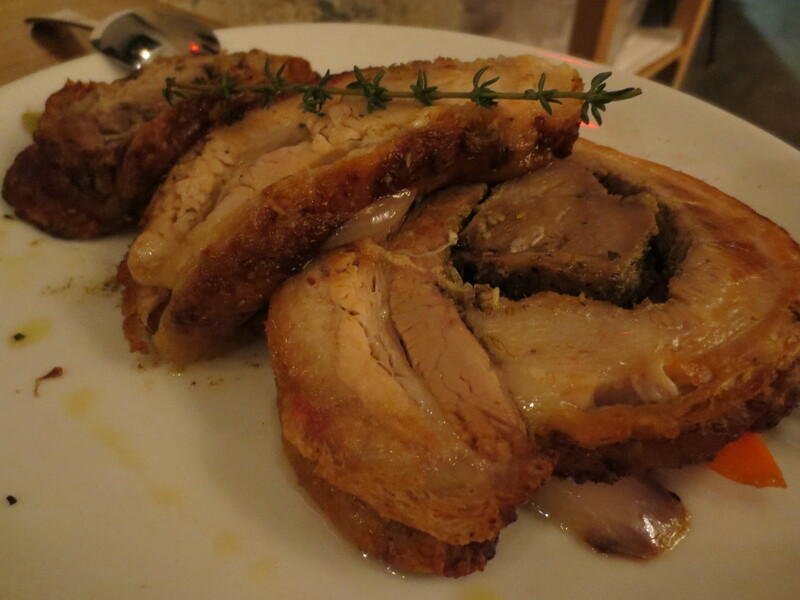 We finished off with the porchetta-something we never order because we know how it can be done so badly with too hard outer rings impenetrable by the tines of a fork or rough in areas and soft in others. We respect pork too much to try its lesser-known applications. Yet, I had an instinctual urge to order it here and was thrilled that I did when what came was a platter laid with meat in circular strata that alternated between liquid, delicious fat, smoky rind, light and tender meat and dark and funky parts—all miraculously juicy and flavorful. Thank goodness I am currently on a dessert ban. Otherwise I would have probably wolfed down the torta sarcena, a buckwheat cake with mascarpone mousse, poached pears and walnuts. What makes Factory Kitchen worthy of my favorite Italian food place in Los Angeles moniker? Especially when I have loved so many other places and dishes in this vein? It is simply within the consistency. Everything was impeccable and that is an uncommon feat; perhaps alluded to in the restaurant’s name denoting the kind of mechanical, automatic assembly line equipped with the proper checks and balances, resided over by an iron-fisted visionary that makes churns out great food each and every time.